Meeting in the air with our partners in the Western coalition, we always appeared to them, as the pilots say, "on the tail," which means victory in real combat. 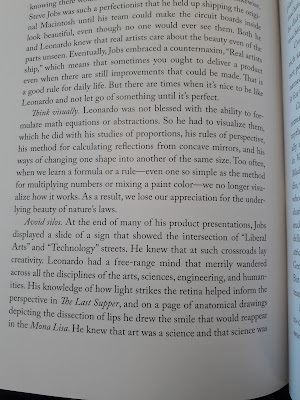 Walter Isaacson's concluding chapter of his Leonardo biography clearly has in mind conference speeches/ management motivational boondoggles and Ted talks on the theme of what large organizations can Learn from Leonardo. The fact that Toomey holds, and sold the tax cut to his colleagues on the basis of, a high confidence that this particular tax legislation will increase growth by 0.4 percentage points annually -- with all the other things that could happen and the huge prospect for changes in tax behaviour -- is a perfect illustration of the economic philosophy of the Republican party. Pull some levers, and 0.4 percent more widgets come off the assembly line! There was a small point which arose in Rome concerning passports, and I did not understand it. It was suggested in the Press that some new European passport is to take the place of the British passport. I would regret that very much. I still cling, old-fashioned as I am, to the British passport and to the words which refer to Her Majesty's Principal Secretary of State requesting and requiring, in the name of the Queen, that people should give us facilities. I hope that that will not be abandoned. If it is, it will be one of those examples of people trying to substitute for the substance of European unity a form of unity which pleases and helps no one. Above, Bernadette Devlin speaking to reporters after slapping Maudling on the floor of the House of Commons after Bloody Sunday in 1972. Priceless combat experience in Syria was received by more than 48 thousand military men of the Russian army, of which more than 14 thousand were awarded with state awards. 80 percent of the operational-tactical crews and 90 percent of the army aviation have from 100 to 120 sorties. The long-range aviation crews received practice of striking at important militant targets. In total, the Aviation and Space Forces of Russia carried out 34 thousand sorties during two years. For the first time, pilots of ship aviation from the heavy aircraft carrying cruiser Admiral of the Fleet of the Soviet Union Kuznetsov participated in combat operations, 420 combat sorties were performed by them. High-precision long-range missiles Caliber, X-101, Iskander, Tochka-U, X-55 and others were used for the most important targets of the militants. Ships and submarines inflicted 100 blows, and strategic aircraft - 66 shots at a range of 500 to 1,5 thousand kilometers. Each missile struck the assigned target. And that's not even the end of his list. Russia's intervention in Syria was a massive military operation, glossed over in gullible media accounts which made it sound like sporadic technical and mostly air and long-range artillery support. Despite yet another Russian announcement of a scale down, their operations continue, both directly and in support of the Assad regime, as manifested in the continuing humanitarian crisis in Ghouta (the scene of the first of the large scale regime chemical weapons attacks). Note to readers: you could free up a lot of time in your life between mid-June and mid-July by not watching the FIFA 2018 World Cup, taking place in Russia. They [EU] expected the first months of 2018 to involve some “unicorn slaughter” as Britain’s illusions were confronted. A major source of such an "emergency" would be healthcare costs, the ability with which to cope is busily being shredded by ... Paul Ryan! the United States shall guarantee to every State in this Union a Republican Form of Government. The head of state has pushed for, and will enact, a law from which he and family will derive big gains. 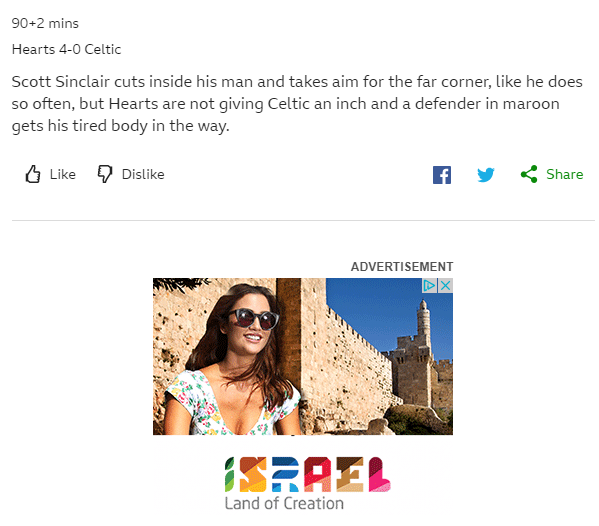 BBC Sports website advertising choice during the updates on the Hearts win over Celtic. For the referendum was not just a vote to withdraw from the EU. It was about something broader – something that the European Union had come to represent. 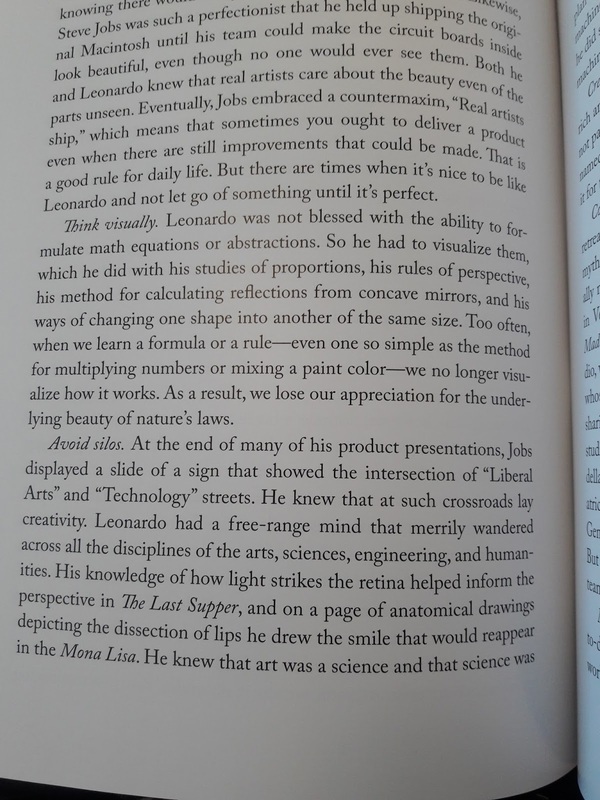 It was about a sense – deep, profound and let’s face it often justified – that many people have today that the world works well for a privileged few, but not for them. Thus, she was equating the EU with what she could criticise in the later part of the speech. Since Timothy contributed to the speech, he should know that. But let’s state one thing loud and clear: we are not leaving the European Union only to give up control of immigration all over again. And we are not leaving only to return to the jurisdiction of the European Court of Justice. That’s not going to happen. That commitment to leave ECJ jurisdiction set up the still-unresolved dilemma of the Customs Union, which was never a point of debate in the referendum. The ECJ issue bubbled up in the Tory hierarchy during 2017, possibly due to a simple misunderstanding in the Johnson household about what the ECJ was. ... Speaker Paul Ryan deserves particular notice for years of intellectual and political spadework. Just in case you think Paul Krugman is exaggerating when he describes Paul Ryan's image in the media. Last week’s deal with the EU may leave the UK tracking Irish regulations for ever (or as Brexiters call it, “freedom”). One senator who listened as the president revived his doubts about Mr. Obama’s birth certificate chuckled on Tuesday as he recalled the conversation. The president, he said, has had a hard time letting go of his claim that Mr. Obama was not born in the United States. The senator asked not to be named to discuss private conversations. There's a lot of connective tissue between the two stories (not least in terms of a common byline, Maggie Haberman), which suggests that Lindsey Graham is in fact the source for the first anecdote. The biggest strategic error was the clash between Crosby’s “strong and stable” message and Team May’s vision of radical social and economic reform. Selling this message of change in six weeks, during an election that was supposed to be about Brexit, was to prove impossible. The manifesto, which sought to define a new type of blue-collar Conservatism by tackling what Timothy saw as the five great injustices in British society, did not tap into a natural voting constituency ... Timothy’s dream of remoulding the Conservative party into a force that speaks more to the people of northern provinces was over. This Red Toryism, as some have termed it, remains an interesting theory that has yet to find a successful vehicle. Red Toryism has an American analogue in the Reformicons, a group of conservative pundits and intellectuals selling a very similar claim, that there is a package of conservative-leaning economic and social policies that can appeal to lower middle and working class voters. Donald Trump may have gotten a little closer to finding that recipe -- as a candidate -- but it's clear that the cultural component of the appeal is more important than the economic one. 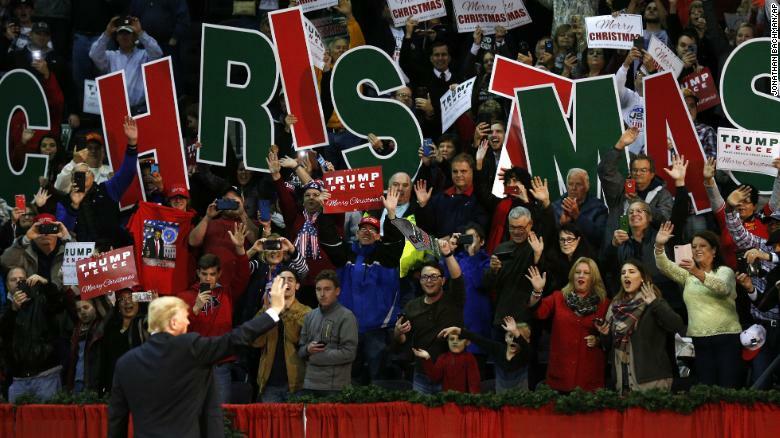 Notice for example the signs at Trump's Pensacola rally last night: his most energized supporters really believe that the "establishment" is out to suppress Christmas. No tweaking of taxes and incentives is going to deal with that. In the absence of agreed solutions, as set out in the previous paragraph, the United Kingdom will ensure that no new regulatory barriers develop between Northern Ireland and the rest of the United Kingdom, unless, consistent with the 1998 Agreement, the Northern Ireland Executive and Assembly agree that distinct arrangements are appropriate for Northern Ireland. In all circumstances, the United Kingdom will continue to ensure the same unfettered access for Northern Ireland's businesses to the whole of the United Kingdom internal market. ... Both Parties recognise that the United Kingdom and Ireland may continue to make arrangements between themselves relating to the movement of persons between their territories (Common Travel Area), while fully respecting the rights of natural persons conferred by Union law. The United Kingdom confirms and accepts that the Common Travel Area and associated rights and privileges can continue to operate without affecting Ireland’s obligations under Union law, in particular with respect to free movement for EU citizens. In other words, Ireland got the following: the UK had to assert that Northern Ireland remains part of the UK, the more than Northern Ireland residents take Irish citizenship, the more it becomes an EU enclave, and Ireland can continue to have its own special arrangements for its citizens resident in the UK. This is a demolition of the Tory/ DUP Brexit. Hearing that Saudi princes were arrested for “corruption” is like reading that Donald Trump fired seven cabinet secretaries “for lying.” You know it has to be something else. Trump obviously missed the story last year that M.B.S. impulsively bought a yacht while on vacation in the south of France — it just caught his fancy in the harbor — from its Russian owner for $550 million. Did that money come out of his piggy bank? Savings from his Riyadh lemonade stand? From his Saudi government 401(k)? The sequencing of him buying a painting of Jesus (possibly as a gift to the Louvre Abu Dhabi) while Jerusalem goes through its current travails is awkward. Implicit in the revelation is that US intelligence leaked the news as a warning to MBS not to make too much noise about Jerusalem. The Times on Wednesday sent detailed questions about the purchase to Prince Bader. The newspaper also contacted the Saudi Embassy in Washington. Three intermediaries for Prince Bader, including two affiliated with the embassy, asked The Times to delay publication to await a response from Prince Bader. 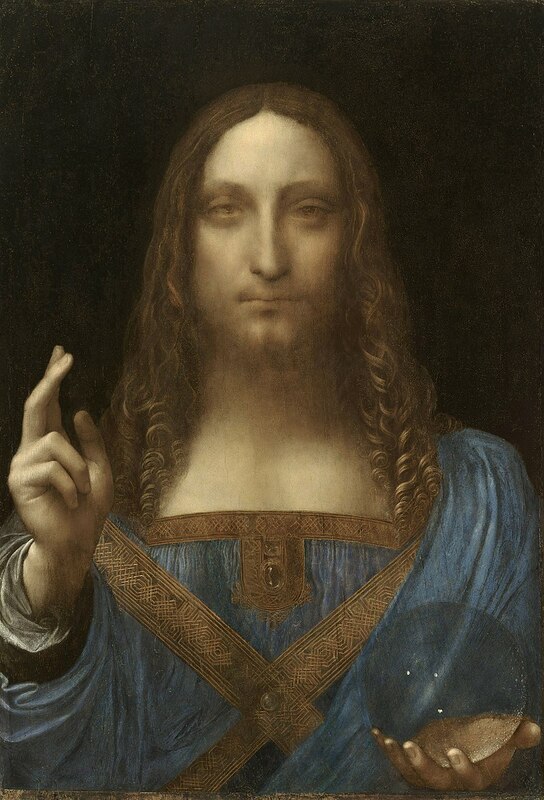 But at the end of the day the intermediaries said Prince Bader would decline to speak, and around the same time, the Louvre Abu Dhabi said on Twitter that it was expecting to receive “Salvator Mundi,” at which point The Times published its article. Other than the tweet, the Louvre Abu Dhabi has supplied no details on the processology of its acquisition, but it was convenient to have the story appear right at the NYT deadline! Winston Churchill: Does not the hon. Gentleman (Foreign Office Minister of State Kenneth Younger) realise that Dr. Weizmann (President of Israel) and King Abdullah (of Jordan) have both, over the vicissitudes of 20 or 30 years, shown themselves always staunch friends to this country, and will he avail himself to the full of the possibilities of bringing these two eminent men into the closest harmonious contact? Am I right in assuming that that is the general path upon which the Government are embarked and which is expressed in the statement to which we have just listened? That was part of a general mood that the Israel - Palestinian issue was still solvable in a modest time frame, and a process that the UK thought it was advancing by recognizing Jordanian control of the West Bank and East Jerusalem. The UK became the only country to recognize the expanded Jordan (the oft-repeated claim that Pakistan also did is contested), and in any event it became moot after the Six Day Year. Anyway, the point is that there's a precedent for one country thinking it can get out in front of a complex process with a unilateral step. Could the hon. Lady answer the question posed by the right hon. and learned Member for Rushcliffe (Mr Clarke), who asked whether she accepts, as he does, that it is a good idea to have regulatory convergence and common rules between Northern Ireland and the Republic? Could she give a straight answer to that, because many in Northern Ireland now view her as being on the side of the Dublin Government on these issues? Lady Hermon: I thank the right hon. Gentleman so much for that. [Interruption.] Yes, what do you do in response to that? There's not much to say that's not already been said about Trump's decision to recognize Jerusalem as Israel's capital, but his speech -- besides afflicted in delivery by an apparent mouth ulcer -- was incoherent, probably reflecting multiple authors. On the one hand, saying that the recognition was the culmination of the Zionist vision of Israel -- that having created a modern country, it deserved a capital. On the other hand, repeated references to the multiple religious claims on Jerusalem, which would be one of the best arguments against a unilateral decision on its status. His focus on the specific details of getting a new US Embassy -- "architects, engineers, and planners" -- suggests that one explanation for the decision may be that, in his mind, a US Embassy in Jerusalem will be a monument to the legacy of ... Donald J. Trump. Saudi Arabia knows a sucker when it sees one. 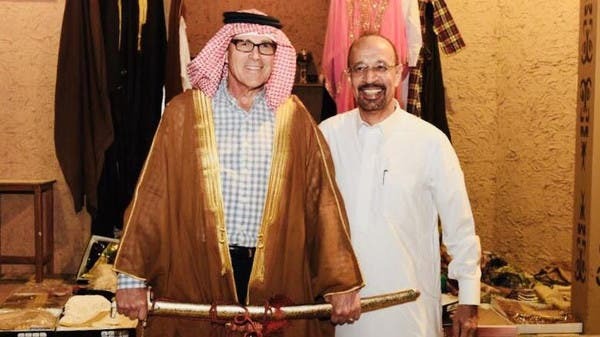 That's US Energy Secretary Rick Perry clowning with Saudi Oil Minister Khalid al-Falih during a visit to the Kingdom. The government has long since figured out that a little desert pageantry buys a lot of White House acquiescence. Former Egyptian prime minister Ahmed Shafik, who last week announced his intention of running for the presidency in 2018, has been taken from his home in the United Arab Emirates and is being deported to Egypt, his family told Reuters on Saturday. An official source has announced that the former Egyptian Prime Minister Ahmed Shafiq has left the UAE heading to Cairo, Egypt. In a statement, the source added that the family of the former Egyptian Prime Minister is still in the UAE under generous care of the country. An official source declared to the Saudi Press Agency that the allegations published by some sources in good intention or otherwise that the Kingdom of Saudi Arabia is embarked on abolishing the apostasy penalty are altogether false and incorrect. The source explained that such groundless claims are absurd according to the ruling system of governance and as per the practices of this blessed country since its institution. He confirmed that the public prosecution is embarked on taking the necessary legal measures to sue who dared to disseminate such lies which go contrary to the constitution of this country. The source stressed that such issue was already determined and un-negotiable at all in the Kingdom of Saudi Arabia. Luckily this issue didn't bubble up during Tom Friedman's visit last week. With an atrocious tax bill about to pass due to a strong alignment of the White House with House and Senate Republicans, has any piece of political analysis of Trump aged more quickly?